How Young Was America's Founding Generation in 1776? A version of this post originally appeared on my other blog, but it seems so appropriate now that I'm sharing it here, too. This miniature portrait of Lt. Colonel John Laurens is one of my favorite paintings in the Portrait Gallery in the Second Bank, part of the Independence National Historic Park in Philadelphia. It's easy enough to overlook. Like so many 18thc miniatures painted in watercolors on ivory, this one needs to be protected from light to keep from fading, and unless a visitor pushes aside the dark cloth shrouding its glass case (which you're invited to do; I didn't break any rules! ), it will be missed. It's also tiny, the most miniature of miniatures. Including its frame of enamel work and cut garnets, it measures only 1-3/4" high. But that's not a face meant to be forgotten. John Laurens was born in Charleston, SC in 1754, into a family remarkable for its power and privilege, and wealth created on the backs of enslaved men and women. Tall and handsome, well-spoken and intelligent, Laurens was educated abroad and destined for a career in law. The Revolution changed that, and against his father's wishes, he joined the staff of Commander-in-Chief Gen. George Washington as an aide-de-camp in 1777. He was 23. He became close friends with both the Marquis de Lafayette and Alexander Hamilton, who considered Laurens his dearest friend in the military. Known for his daring and impetuous courage in battle, Laurens was equally daring in his beliefs. Despite being the son of a slave owner and seller, Laurens believed that all Americans, regardless of race, should be equal in the new republic, and he campaigned for the enlistment of enslaved men in the Continental Army as a way for them to earn their freedom - an unpopular idea that was never put into action. Laurens made his mark on both the battlefield and as a statesman, serving as a special minister to France with Benjamin Franklin to help secure French aid for America. He fought in the last major battle of the war at Yorktown and survived, only to be killed in a meaningless skirmish in 1782, weeks before British troops finally left America for good. He was only 27, his immense promise cut short. 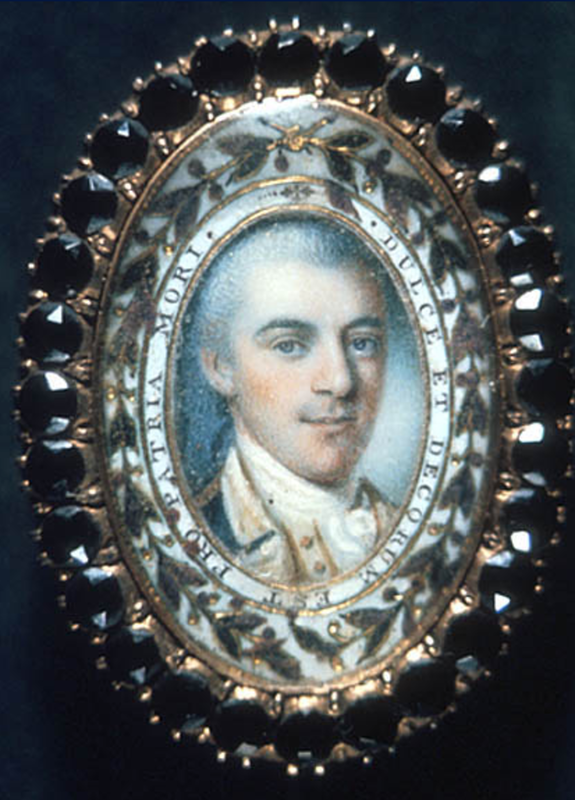 This miniature was a copy of an earlier portrait by the same artist, and was painted after Laurens' death as a memento for one of his former comrades, Maj. William Jackson. The Latin motto around the miniature's frame reads "Dulce et Decorum est pro patria mori" ("It is a sweet and honorable thing to die for one's country." A noble sentiment, indeed. But Laurens' good friend Alexander Hamilton was devastated, and in one of those historical "what if's" it's impossible not to wonder what both men would have achieved together if Laurens had lived. All of which made me think, too, of how young so many of the major figures of the American Revolution were when the Declaration of Independence was signed on July 4, 1776. My two main characters in I, Eliza Hamilton were among the youngest: Alexander Hamilton was around 21 (his birthdate is uncertain), while his future wife Elizabeth Schuyler was 18. John Laurens was 21, and Aaron Burr 20. The Marquis de Lafayette was 18, Betsy Ross 24, Henry Lee III 20, James Monroe 18, and James Madison 25. For fans of the TV series TURN, John Andre was 26, Benjamin Tallmadge 22, Robert Townsend 22, Abraham Woodhull 26, and Peggy Shippen a mere 16. Slightly older (though not exactly greybeards) were Abigail Adams at 31, Thomas Jefferson 33, John Hancock 39, Thomas Paine 29, and John Adams 40. Even George Washington, the future Commander-in-Chief, was only 44, and his nemesis King George III was 38. They were young men and young women brimming with enthusiasm, dedication, and fierce devotion to their ideals and dreams, and to making their world a better place. Consider how our current government is one of the oldest in American history: the average age for members of the House of Representative is 57 and for Senators 61, with a president who's 71. I, for one, am glad to see that revolutionary youth and spirit once again rising up today among those who born around the turn of the 21st century. Who knows what brave new things they, too, can accomplish? 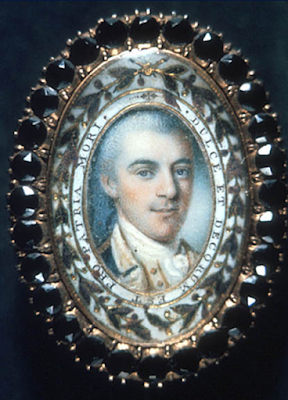 Above: Miniature Portrait of John Laurens by Charles Willson Peale, c1784, Independence NHP. Though dukes, by and large, are nothing like as numerous or as attractive as we paint them in romance novels (as I describe at RT Book Reviews), and any number have fallen on hard times in the past and present, things were not so bad for the 11th Duke of Bedford. While other noble families changed or economized as the times demanded, the Bedfords continued in the lavish late Victorian/Edwardian style until 1940. “The [11th] Duke always started meals with his own cup of beef consommé and a plate of raw vegetables served to him on a three-tiered dumb-waiter. 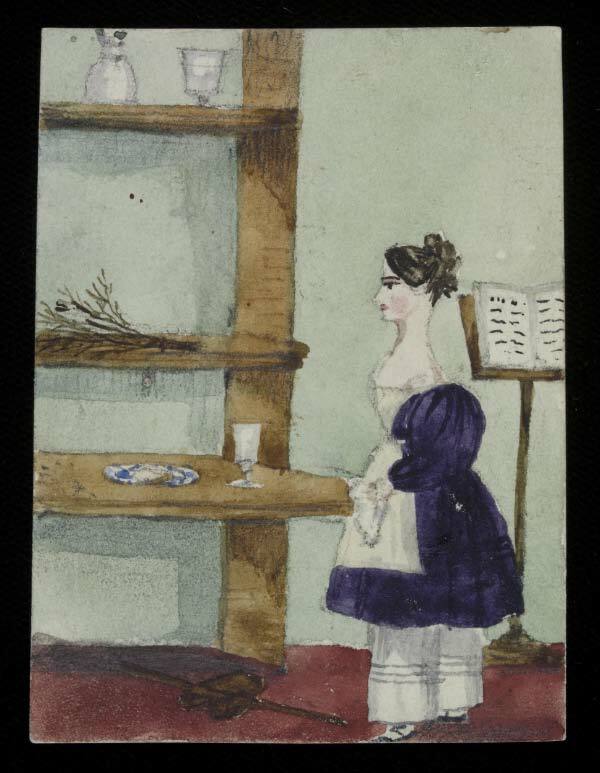 The Duchess’s secretary-companion had her own quarters that included a cook and a maid.” The duke’s mistress had her own rooms with her own staff—on the premises, I assume? Apparently, the 11th Duke of Bedford is also responsible for the grey squirrel invasion of England. Images: Woburn Abbey, from Francis Orpen Morris, The County Seats of the Noblemen and Gentlemen of Great Britain and Ireland 1866; 11th Duke of Beford in Coronation Robes, Photo credit: Middlesex Guildhall Art Collection. • Considering a single, surviving silk shoe, made in London c1760. • Remembering when London's pubs were full at 7:00 am. • The remarkable story of James Hamilton, born at Fort Ticonderoga during the American Revolution, and killed at the Battle of Waterloo. • The Fisk Jubilee Singers: preserving African American spirituals. • How Victorian governesses were in danger from their employers. • Amazing story of the revival of Pawnee Eagle corn, thought to be extinct. • Rare Roman boxing gloves found near Hadrian's Wall. • Student discipline at Amherst College 200 years ago for offenses that included "an opprobrious inscription upon glass" and drinking cherry rum. • Robert "Romeo" Coates: a very bad Regency actor. • One of the oldest trees in Manhattan: the "Hangman's Elm" in Greenwich Village. • Founding Father firepower: metal intended for statues of George Washington was used to arm the Confederacy. • Image: Delightful "puzzle purse" Valentine, c1810. • Cornelia Sorabji, the first woman to practice law in both India and Britain. • Edward Dando, the celebrated gormandizing oyster-eater. • The man who lived and died in his wife's Brooklyn tomb. • Recreating Georgian tent follies from c1760. • Francis Scott Key: A young man and his portrait. Rather a long time ago, at the end of the England trip that led to my writing Lord of Scoundrels, my husband and a friend and I visited Knole. 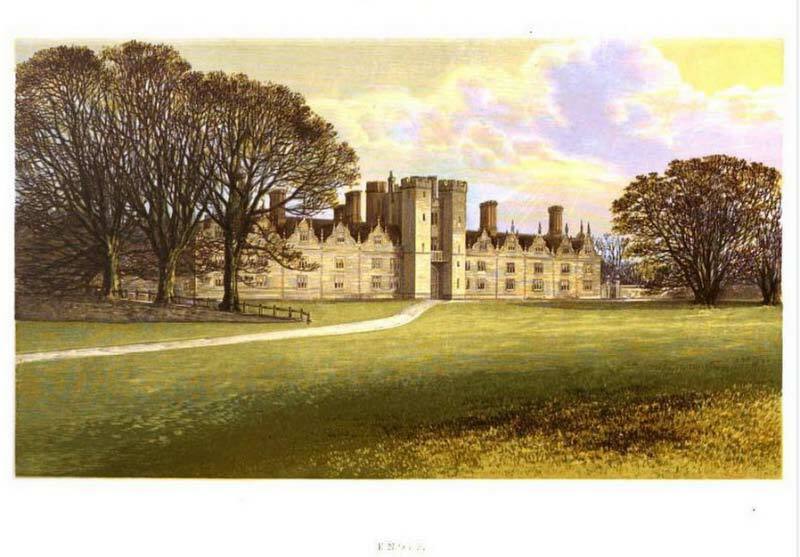 By this time, we’d explored a number of stately homes, but Knole was an entirely new experience. This wasn’t simply because the early Jacobean structure was older than many of the homes we’d visited, but because so much of the centuries-old stuff inside wasn't renovated or restored, but the original stuff, fading and tattered. While conservation work is ongoing, and a great deal has been done since we visited, it’s still possible to see some these furnishings, and they do give the place a different atmosphere from that of other great houses. Then, too, there’s the sheer size of the place. I'm pretty sure the impression it made led to my fascination with Jacobean mansions, and having my characters live or get married in them. The video is one from Knole's YouTube channel where, among other things, you can watch conservation in process. Readers who receive our blog via email might see a rectangle, square, or nothing where the video ought to be. To watch the video, please click on the title to this post or the title of the video. Forget President's Day - today is the real birthday of George Washington, born on February 22, 1732 (Georgian calendar.) Two hundred eighty-six years later, he remains the best-known figure in American history: the commander-in-chief of the Continental Army during the American Revolution, the first president of the United States, and the white-haired gentleman on the one-dollar bill. As can be imagined, Washington's image was much in demand, and over his lifetime, he sat for many portraits by many artists. The one shown here, however, is different. None of those other portraits were commissioned by a Scottish earl. David Erskine, 11th Earl of Buchan (1742-1829) was a man of many interests. He encouraged engineers designing new kinds of bridges, and he published an essay honoring the controversial Scottish politician Andrew Fletcher of Saltoun. 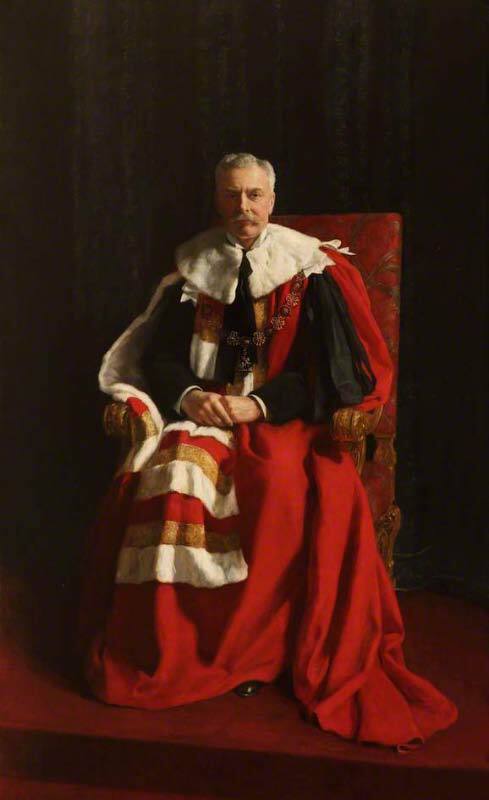 He served both as a diplomat, and as the Grand Master of Scottish Freemasons. His correspondents included Horace Walpole, George Dyer, and George Washington, whom he greatly admired. In Philadelphia, Robertson painted miniatures of both George and Martha Washington. His portrait of Washington, lower right, shows the president as he likely appeared in late 1791: his hair receding, his cheeks hollowed, and the strain of his responsibilities clear in the general weariness of his expression. But the portrait he painted at the same time for the Earl of Buchan, above, shows Washington as a younger man. Not only is he portrayed wearing his general's blue and buff uniform from the Revolution, but the years and the cares have been wiped away. 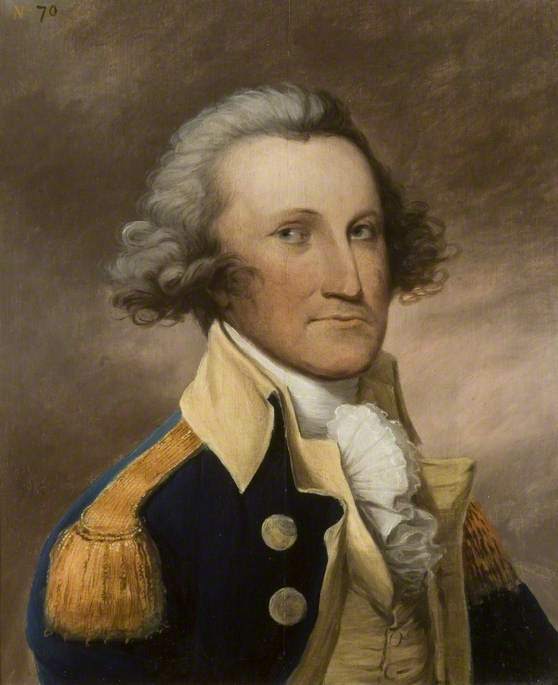 His cheeks and hair are fuller, his expression alert and confident: it's the face of the commander-in-chief of the 1770s. Was this done at the request of the earl, or did Robertson decide a little judicious 18thc Photoshopping might make the portrait more agreeable to his patron? "The manner of the execution does no discredit, I am told, to the Artist; of whose skill favorable mention had been made to me. I was further induced to entrust the execution to Robinson [sic] from his having informed me that he had drawn others for your Lordship and knew the size which would best suit your collection." Unfortunately, there's no record of Buchan's reaction to the painting, but one hopes it did find an honored place in the earl's collection. According to ArtUK, over time the portrait suffered damage, was repaired, and perhaps worst of all, became mislabeled as "A Naval Officer." A cataloguer in the 1930s correctly re-identified the portrait as Washington, and in 1951, the current Earl Buchan presented the painting to Sulgrave Manor, the English birthplace of Washington's ancestors, where it hangs today. Above: George Washington as a Younger Man by Archibald Robertson, c1791-93, Sulgrave Manor. 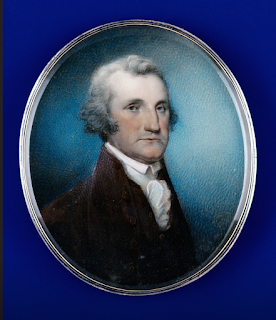 Below: Miniature portrait of George Washington by Archibald Robertson, 1791-1792, The Colonial Williamsburg Foundation. 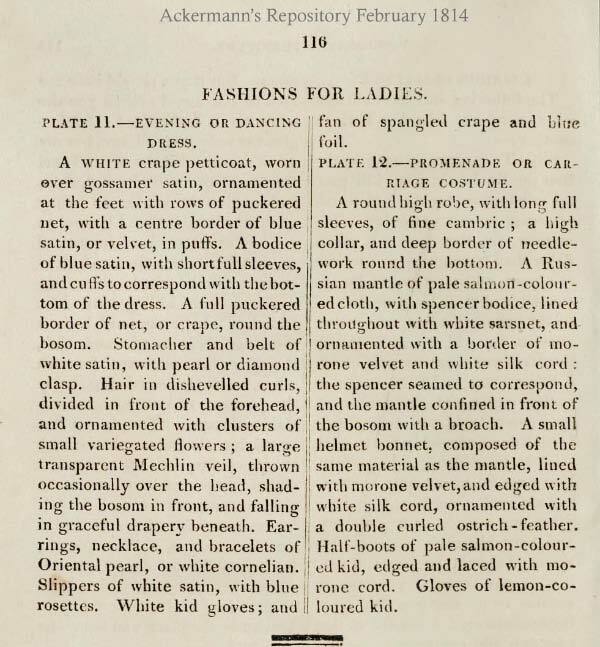 This sort of thing fit the late Victorian and Edwardian eras, when everything seems to have become so very strict: divisions between classes, excruciatingly complicated etiquette, and fashion. But I had not thought about posture devices for the earlier period. After all, Susan and I are well aware that acutely straight posture was the order of the day in the 18th and 19th centuries. Women’s shoulder blades were supposed to come as close as possible to meeting in the back, and dress designs reflected this. The corset and especially the busk were all part of maintaining elegant posture. 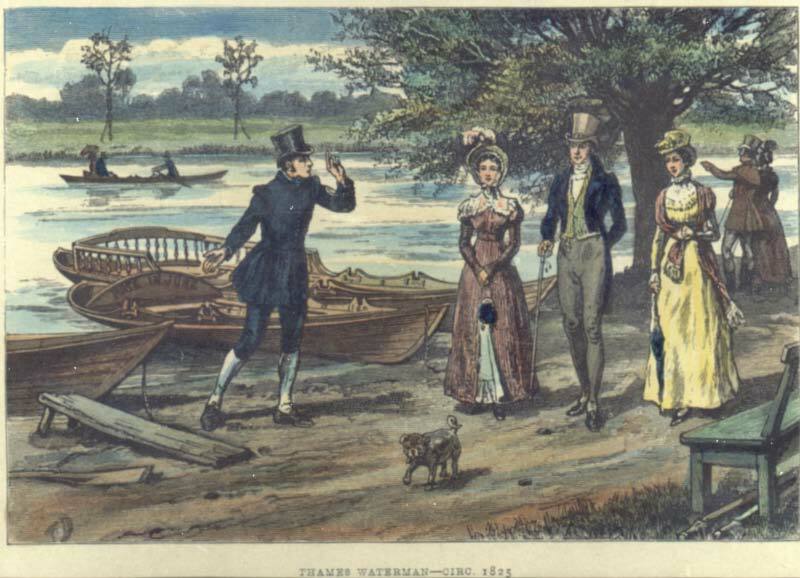 Then, thanks to Susan's alerting me to an image, I bought and started reading Susan Lasdun’s Making Victorians: The Drummond Children’s World 1827-1832. It has proved enlightening on a number of counts, not least the posture devices used on girls in the pre-Victorian era. 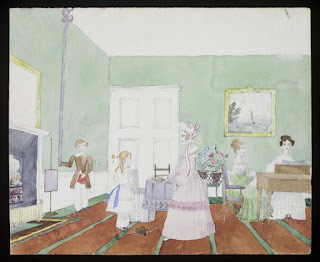 An especially poignant image, a watercolor by Cecile Elizabeth Drummond (at top), brought the point home forcibly—as it evidently did to the errant child. At her feet lies her backboard, which she’s apparently abandoned. And there is Mama, holding a birch rod—a bundle of twigs with which the little girl will be punished for her misbehavior. Lady Lasdun describes the backboard as a “painful” device, yet I’ve seen images of modern children wearing such backboards, in re-enactments (here, here, and here, for example). If it truly were painful, would the re-enactment have been allowed? And would someone be selling them as "only suitable for use by children."? No doubt the backboard wasn’t comfortable—in the book are several images of children who’ve discarded their backboards and are anticipating a whipping—but it was probably less painful than the whipping, and certainly more comfortable than the iron monstrosity Consuelo Vanderbilt endured. Frankly, I suspect this sort of thing would have benefited my posture enough to compensate for the unpleasantness…though of course I wouldn’t have thought so at the time! 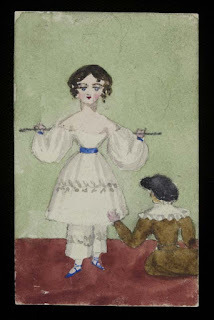 Images: watercolors by Cecil Elizabeth Drummond, 1828-30 (made); Prints, Drawings & Paintings Collection; Given by Miss Barbara Drummond, © Victoria and Albert Museum, London. 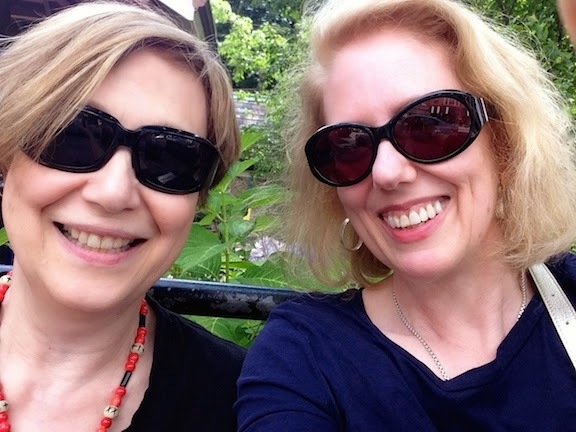 If you're reading this blog, you're most likely a history nerd, and proud of it, too. 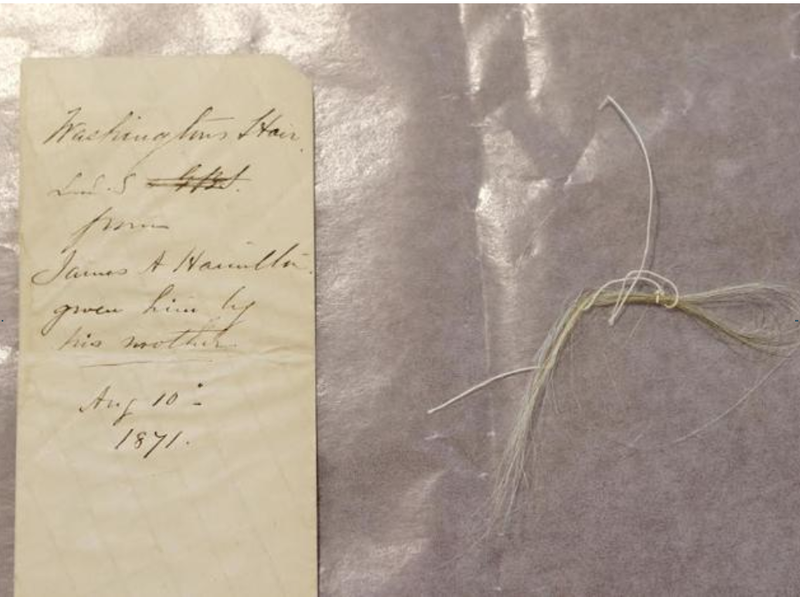 It also likely means that somewhere you've read this week's favorite history story in the mainstream media: how a few strands of George Washington's hair were discovered tucked inside a 200-year-old almanac in the rare book library of Union College. Partly because it's almost Washington's birthday, and partly because it IS an interesting discovery, the story has been everywhere, including the Washington Post, The New York Times, USAToday, Newsweek, Newsday, US News & World Report, and the Smithsonian's SmartNews, NPR, and network and cable outlets as well. Last time I checked, it had appeared in over 200 outlets. The almanac (shown above) - and the hair - were discovered during an inventory of the archival collections of Schaffer Library, Union College. Bound in red leather, Gaines Universal Register or American and British Kalendar for the year 1793 was a popular volume for gentlemen of the time, and contained useful, everyday knowledge such as population estimates for American cities and comparisons of various coins and monies. The almanac is inscribed "Philip Schuyler's a present from his friend Mr. Philip Ten Eycke New York April 20, 1793." 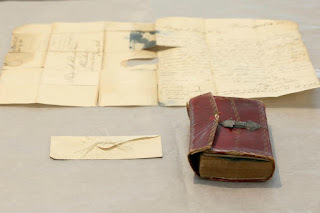 Tucked inside the almanac were several pages of handwritten notes and a business letter, which make the owner more likely General Schuyler's son, Philip Jeremiah Schuyler (1768-1835). Also inside the almanac was a slender yellowed envelope, upper right, with this written on one side: "Washington's hair, L.L.S. & (crossed out) GBS from James A. Hamilton given him by his mother, Aug.10, 1871." 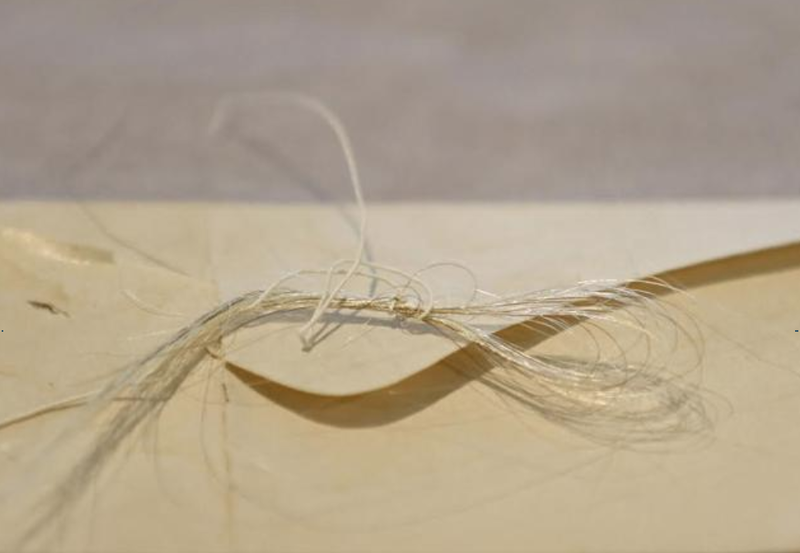 Inside the envelope were a few white hairs, tied together with a thread, left. Who were all these people, and could their identities help prove that the hair really had come from Washington? 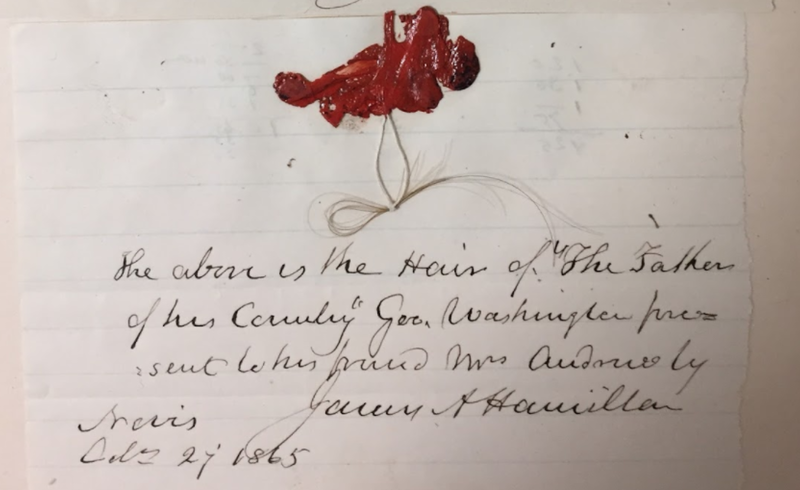 A Google search by Phillip Wajda, Union's director of media and public relations brought him to my blog post about historic hair in the collection of the Massachusetts Historical Society. (See the strands of Washington's hair, held together with red wax, that belong to MHS, lower right.) 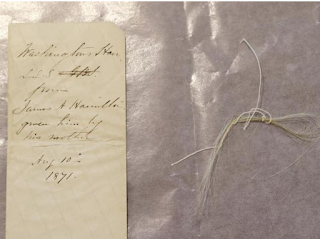 The handwriting accompanying that hair does appear to the be same as is on the envelope, belonging to James Alexander Hamilton (1788-1878.) 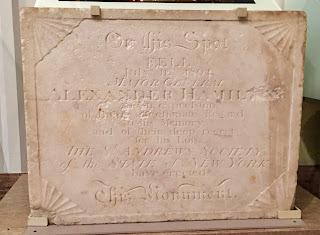 James was the fourth child of Elizabeth and Alexander Hamilton, and, like his mother, was very aware of both his father's legacy and his family's place in American history. Locks and strands of hair were often exchanged, especially as tokens of a deceased loved one. While it's impossible to be absolutely certain without DNA testing, the hair's provenance makes a strong case for it having come from Washington. The Hamiltons were close to the Washingtons, and it's likely that Martha shared George's hair with Elizabeth after George's death, if not before. It therefore makes sense that James passed along the hair given to him by his mother, Eliza, as he wrote on the envelope. He gave the hair to family members who would have appreciated it, too. Thanks to the assistance of Jessie Serfilippi, an interpreter at the Schuyler Mansion in Albany, we determined that the initials refer to James's granddaughters, Louisa Lee Schuyler (1837-1926) and Georgina Schuyler (1841-1924.) The sisters continued the family interest in history through historic preservation - an idea growing in the late 19thc-early 20thc with a renewed appreciation for the country's early history. Together the sisters were instrumental in making Gen. Schuyler's grand colonial house in Albany into a New York historic site in 1917. At some point, the envelope with the hair must have been slipped into the almanac for safekeeping, forgotten, and then later donated to Union. Upper photos ©2018 Union College. 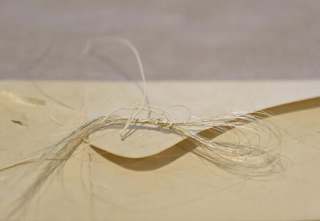 Lower right: Strands of hair belonging to George Washington, Massachusetts Historical Society, photo ©2017 Susan Holloway Scott. • Archaeologists think this spinning disk - at least 14,000 years old - may have been a child's toy. More about ancient toys and children here. • Tulipmania: the classic story of a 17thc Dutch financial bubble is mostly wrong. • A grand piano bought by Queen Victoria as a gift to Prince Albert in 1854. • The bloody world of Georgian female boxing. • Filling in the 19thc history of pregnancy and dress. • Image: Believed to be the earliest identified sampler by an African American, this rare work from 1793 carries a beautiful message. • Queen Elizabeth I and Robert Dudley: the real story. • The earliest photographs of the Henry Clay Frick mansion before it became an art museum. • Image: A delicate mourning bonnet, c1870. • The beautiful chaos of improvisational quilts: jazz with a needle. • For author Mark Twain, it was love at first sight..
• Seven black nurses who changed medical history. • Image: The contents of President Abraham Lincoln's pockets the night he was assassinated. • Video: The only artifact in the collection of Fort Ticonderoga certain to have been used by a woman. • Get your quills ready: a short guide to making a medieval manuscript. 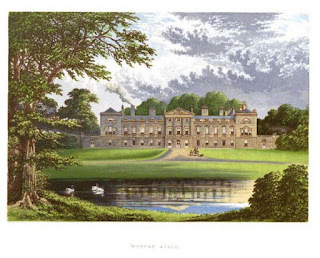 • Now on-line: the commonplace books of Lady Augusta Murray, who married George III's son, the Duke of Sussex, and had his children, but then saw their marriage ruled invalid. Everyone by now knows of the ongoing love affair that Loretta and I have for automata, those amazingly crafted and amazingly beautiful mechanized toys for their very wealthy. Somehow, I'd never come across this one before, and it's a stunner. According to the information provided by Waddesdon Manor, the present owner of this automaton, this chased bronzed and bejeweled elephant was created in London around 1768-1772 by Hubert Martinet, described as a "businessman-entrepreneur" who likely oversaw a workshop of highly skilled French craftsmen. Many such automata were intended as gifts for Indian officials and rulers as part of the complicated trading protocol of the French and English East India Companies. For whatever reason, however, this elephant - glittering with gilt and paste jewels - was never sold for that purpose. Instead it was widely exhibited in London, Paris, and the Netherlands, passing through several owners. It was finally purchased by Baron Ferdinand de Rothschild sometime before 1889, and added to his collection of treasures at Waddesdon. Musical automaton, signed Hubert Martinet, 1768-1772, Waddesdon Manor. If you receive this post by email, you may be seeing only a blank spot or black box where the video should be. Please click here to view the video. By 1833, the time of A Duke in Shining Armor, it would have been simple enough for my hero and heroine to get on a steamboat to continue upriver from Battersea Bridge. I decided to put them on a wherry instead. The chances of mishap on either vessel were good: Steamboats exploded, and wherries overturned or lost passengers overboard. And of course, I’m always looking for ways to make my characters’ lives difficult. The wherries, about which I knew next to nothing, however, were aesthetically pleasing, and turned out to have a long history, while the watermen had a distinctive character. 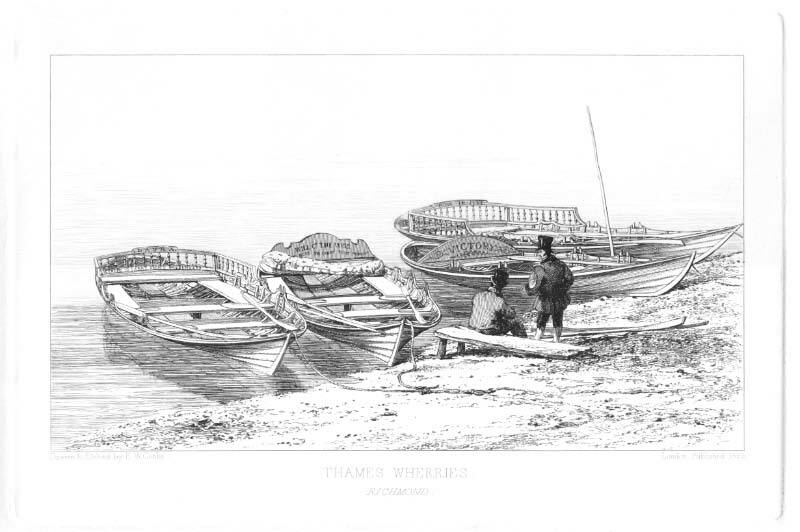 Though I found images of wherries with a top covering, like the one described in the book, only recently did I come upon the term for these boats: “By a 'tilt' boat of course is meant a boat with a covering." —Old and New London Vol 3. Or, as the OED describes it: "tilt-boat n. [SE tilt-boat,] ‘a large rowing boat having a tilt or awning, formerly used on the Thames, esp. as a passenger boat between London and Gravesend." 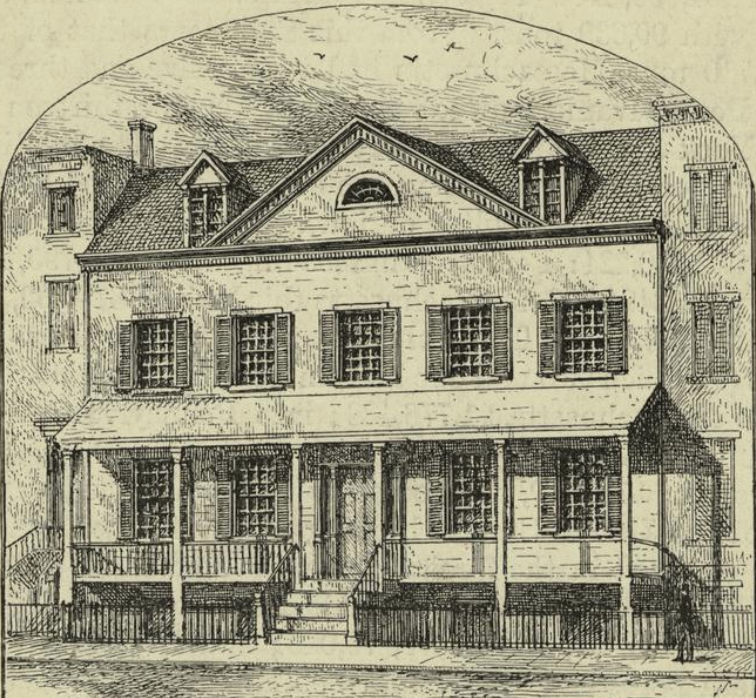 Partially paralyzed, bleeding profusely, and drifting in and out of consciousness, Hamilton was taken back to Manhattan to the house of Nicholas Bayard, upper right, where he died the following afternoon, surrounded by his grief-stricken family and friends. In addition to his widow Elizabeth Schuyler Hamilton, he left behind seven children, the youngest still an infant. Less than three years earlier, the Hamiltons' eldest son, Philip, aged 19, had also been killed in a duel defending his father's honor - possibly with the same pistols. Within a year of Hamilton's death, a marble monument in his honor had been placed at the site of the duel at Weekhawken, left. Before long, souvenir-seekers had chipped away so many pieces of the marble that the monument was finally taken down around 1820, and later in the century the original dueling grounds were obliterated by railroad construction. 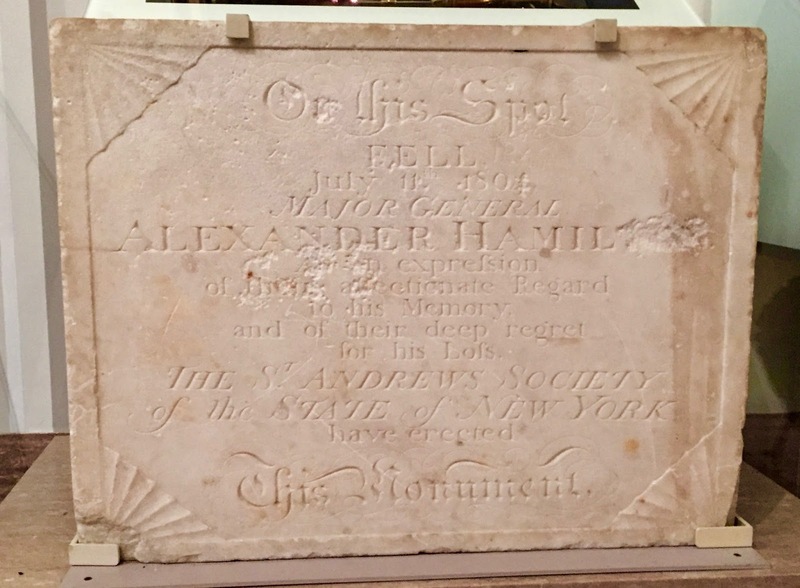 Only the pitted marble plaque from the monument's base, lower right, now remains in the New-York Historical Society. 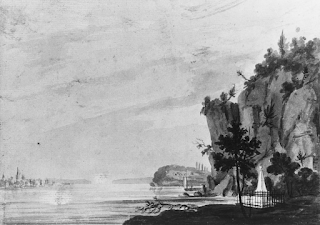 Today the duel is commemorated in Weekhawken with a small park at the top of the Palisades overlooking the original site. The park includes a bust statue of Hamilton, the stone where he was traditionally believed to have rested against after being wounded, and a stunning view of the Manhattan skyline. It's become such a popular site for visitors that it now has it has a page on TripAdvisor. 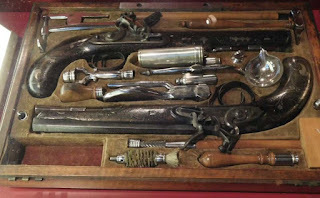 The New-York Historical Society also owns exact replicas of the pistols used in the duel, above. The original 18thc pistols were made by the noted gunsmith Robert Wogdon in London, and belonged to Hamilton's brother-in-law, John Barker Church. 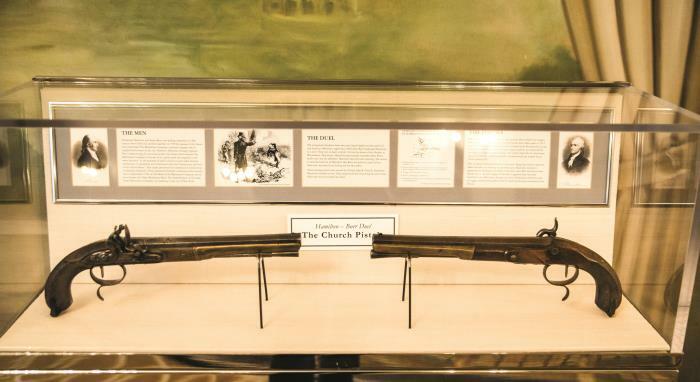 The original pistols still exist, and are now in the headquarters of J.P. Morgan & Chase Company. This modern bank is the descendant of The Manhattan Company, founded by Burr in 1799 as a water service company - which quickly evolved into a bank to rival the Bank of New York, founded earlier by Hamilton. Top: Hamilton-Burr Dueling Pistols, replica set, 1976, New-York Historical Society. Photo ©2017 Susan Holloway Scott. Upper right: Bayard House (Where Hamilton Died), 1892, New York Public Library. 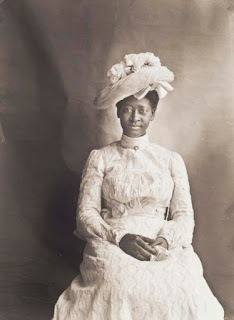 A little over a hundred years ago, a white photographer took hundreds of pictures of people in central Massachusetts. Among these were more than 230 portraits of people of color who lived within easy walking distance of my home. I had no idea this community existed until I went to see Rediscovering an American Community of Color: The Photographs of William Bullard at the Worcester Art Museum. There are several amazing things about this exhibition. First, the glass negatives survived for over a century and ended in the hands of a collector who was also a devoted Worcester historian. * Second, the photographer’s logbook also survived, and stayed with the photographs. Third, thanks to his granddaughter’s making the connection between tiny numbers on the negatives and the logbook, it became possible to identify the people in the photographs. Thus, the Clark University students who researched the photographs were able to contact many of their subjects’ descendants. Also, during my third visit to the exhibition (yes, it’s that good, that moving), I got to meet one of those descendants. Since it’s impossible to do the show justice in a blog post, I offer links. The Worcester Art Museum page on the Bullard exhibition includes several reviews well worth reading as well as a short YouTube video. This exhibition runs until 25 February—only a few more weeks. 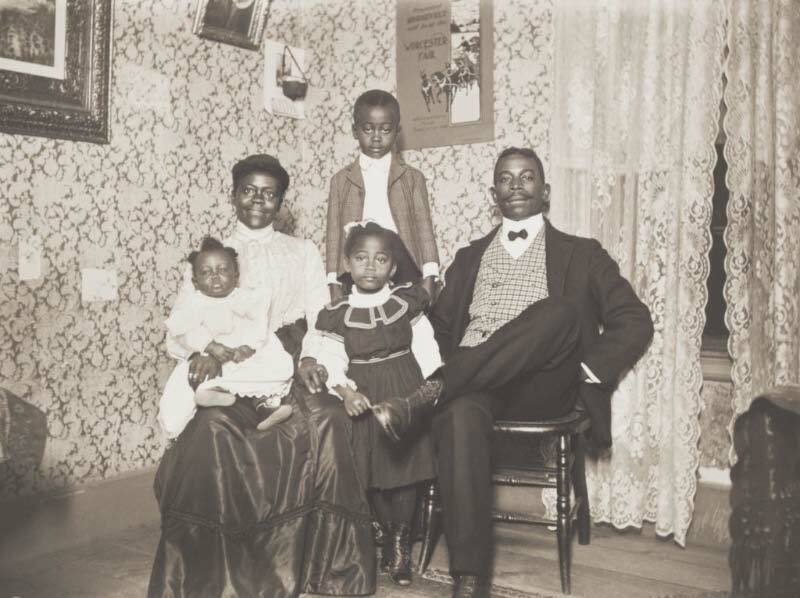 However, thanks to Clark University’s collaboration with the museum, we can see many of the images at the website, Rediscovering an American Community of Color: The Photographs of William Bullard, 1897-1917. 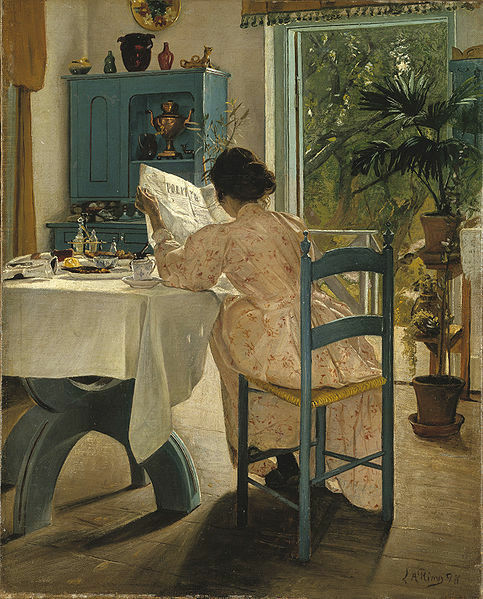 There you’ll find not only a gallery of the photos, but also a page about the collection and the photographer, a map of the neighborhood in 1911, essays connected to the images, and a chance to add information and/or comment on individual photos. I also highly recommend the beautiful exhibition catalog. *Frank J. Morrill, a retired history teacher and collector, and definitely and delightfully a Nerdy History Person. Images: William Bullard, Martha (Patsy) Perkins, 1901 and Thomas A. and Margaret Dillon Family, about 1904, courtesy of Frank Morrill, Clark University and Worcester Art Museum. • Illustrating carnival: exploring the fantastic, forgotten artists of early Mardi Gras in New Orleans. • Wonders of the hidden edge: fore-edge paintings from the New-York historical society, here and here. • Beyond the slave trade: the little-known trade in slave cadavers. • Women that conquered the world of comics. • Image: A stunning pair of women's tall bespoke boots, 1890s. • Don Pedro, the last true pirate to raid the Atlantic Sea - in 1832. • So which city was first called the "Cradle of Liberty"? • "The hall is enormous....3,700 people!" Charles Dickens wrote this letter to his wife Catherine in 1854 about his popular reading tours. • The remarkably beautiful carpet pages from the Lindisfarne Gospels, c700. • Image: The colors of the women's suffrage movement - purple, green, and white - appeared in everything from brooches to banners. • How to have a 18th-19thc historically accurate lovers' tiff. • Nerdy History Girl goals: to visit England's historic hotel network. • Image: An American Merchant Tours Yokohama, 1861. 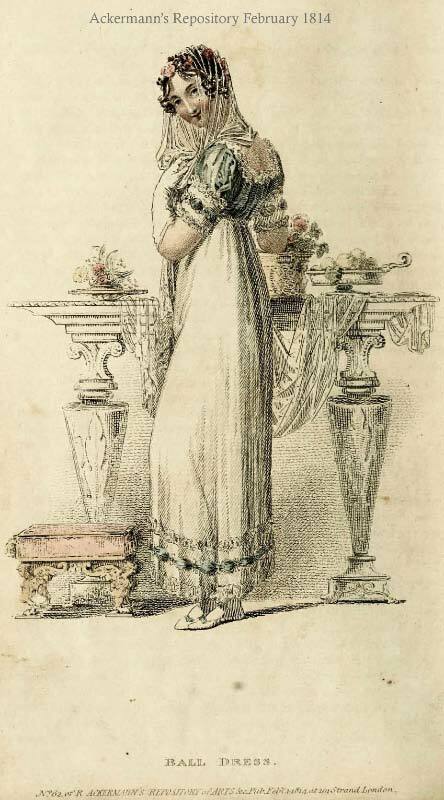 • The humble apron of the 18th century. • Introduced in 1945, and "designed for generations of use." • Where the Dickens (hint, hint) did that word come from? • Sheer beauty of nature: video of manta rays who leap balletically from the water nine feet into the air. As promised, today we have some video dealing with early 19th-century pistols. You might want to watch “A brief introduction to the rules of historical pistol duels” as well, though I ask you to bear in mind that the Code Duello was not followed by everybody everywhere. For the duel in A Duke in Shining Armor, I referred to The Art of Duelling (1836), whose rules are different. This same gun aficionado simulates a duel here. This and today's official video make it clear how difficult it was to shoot accurately, even with the finest pistols and lots of practice. In short, in my story I did take liberties regarding the level of accuracy generally possible. 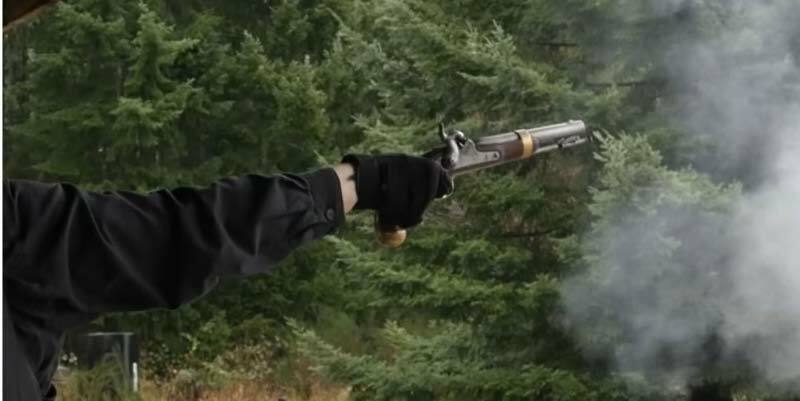 Though the video doesn't show the loading process in quite as much detail as this Nerdy History Girl could wish, Sklar does give an idea of what was involved in loading a pistol, while his examination of the gun offers a clue to how many things could go wrong—as The Art of Duelling emphasizes. Image at top is a still from the video. Readers who receive our blog via email might see a rectangle, square, or nothing where the video ought to be. To watch the video, please click on the title to this post or the title of the video. A duel figures prominently in A Duke in Shining Armor. I’ve posted about dueling practices (here and here), and will again. Today, though, I thought you might want to take a look at some actual weapons. “In the case with these pistols are the necessary accessories for cleaning and loading them. These include a brush, a powder flask, a ram rod, a bullet mould and a ladle for pouring the molten lead to make the bullets…The barrels of the pistols are double-stamped with the mark of two crossed sceptres beneath a crown. This records that they were made privately and proofed (test-fired) at the Board of Ordnance proofing house in the Tower of London. The pistols are fitted with rain-proof flash pans, an innovation that kept the powder dry in bad weather. The name on the lockplate 'Toms' is likely to be an engraving error. 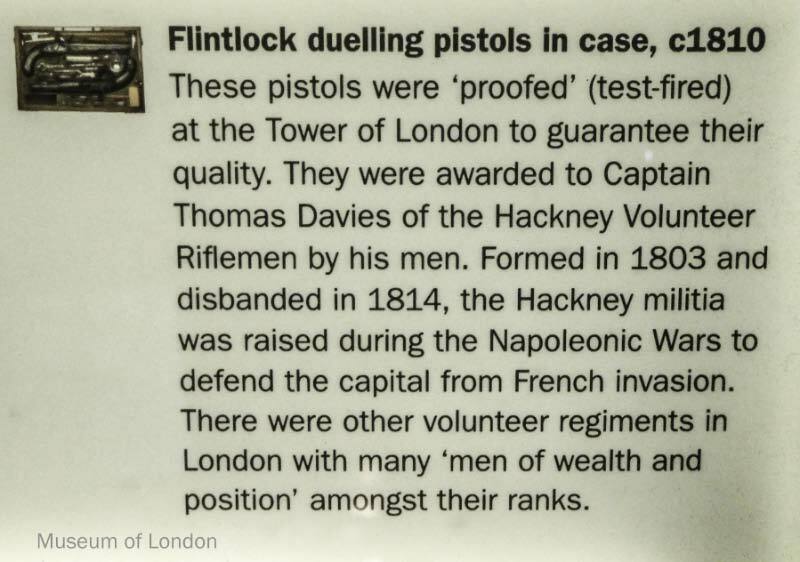 The pistols were probably made by William Tomes, a gunsmith with a workshop on Whitechapel Road. 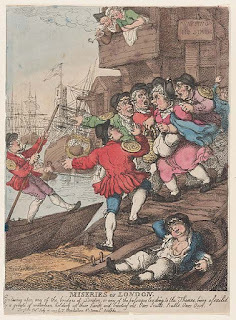 Tomes was a military contractor who supplied guns to the East India Company." In my investigations online, however, most of the cases are a little simpler. Preparing, loading, and firing a a gun in the early 1800s was, however, a complicated business. But a video is worth thousands of words: Please watch for a demonstration on Friday's video. Readers of Georgette Heyer, not to mention numerous other Regency-era authors, will have come upon the name Manton. You can get several close-up views of a Regency era pair of these highly regarded dueling pistols here. Photographs copyright 2018 Walter M. Henritze III. Today, we're all accustomed to lives that are driven and measured by time. Watches, clocks, and cell phones are synchronized in precise unison, and each day we work and play, attend meetings, movies, games, and performances, catch trains and eat meals, rise and sleep, by a clock's measurements. But it wasn't that way in late 18thc America. Precise measurement of time was an elite luxury. The majority of people didn't own watches or clocks. 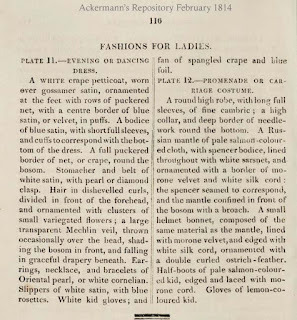 Even for those with sufficient wealth to possess a watched tucked into a fob pocket or clipped to a chatelaine at the waist, accuracy was variable, and being punctual was subjective. Instead people relied upon more general ways of determining time based on the sun and moon in the sky, or the cries of a watchman, or the still-rare public clock in the tower of a church or other public building. The average workday wasn't nine-to-five; it was from sunrise to sunset, and varied with the seasons. The two case clocks shown here are the exception. Both are the work of Robert Joyce, a clockmaker who trained and worked in London and Dublin before establishing himself in New York City, where these two clocks were made in the 1790s. Although elegantly encased in gleaming mahogany with inlay work (the ovals of sixteen stars represented the then-number of states in the union). The clocks would have been the epitome of modern technology at the time, with 8-day weight-driven movements. They're also very tall, over ten feet in height. They would have been impossible to ignore, which was likely exactly what the man who commissioned them would have wished. Alexander Hamilton (1757-1804) was one of the most productive men of his age (or any other, for that matter.) He was a workaholic long before the word existed, and in the course of his short life, he wrote letters by the thousand, juggled complicated matters of government policy and diplomacy, handled precedent-setting-legal cases, and created the basis for the American financial system. It's not surprising that during the Revolution, he became Gen. George Washington's favorite aide-de-camp on his personal staff. Hamilton got things done. As the new country's first Secretary of the Treasury, Hamilton oversaw the largest single office in the federal government in the then-capital of Philadelphia, and he expected his clerks and other employees to share his ferocious work ethic. Even during the onslaught of the city's Yellow Fever epidemic in 1793 - a terrifying disease that claimed hundreds of people, rich and poor - many of Hamilton's clerks continued to report for work until the office was officially closed. By tradition, Hamilton commissioned the clock on the top left for the Bank of New York, which he had established in 1784. Its near-twin on the lower left was made for the First Bank of the United States, lower right, (and more info here about plans to restore it) which Hamilton helped charter in 1791. Both clocks were made about 1797. The two banks were grand, imposing buildings, and the towering clocks would have been designed to fit the financial magnificence. Clocks represented efficiency, an admirable quality in a bank, and a clock of this size and obvious expense would also have suggested prosperity and permanence. Still, I can't help but imagine the effect that such a clock's size and relentless ticking must have had on the clerks who toiled nearby - a painfully modern reinforcement that time is money, and money time. Each click of the hand must also have been an unending reminder of Hamilton's own determination to squeeze as much as he could from every minute - a daunting expectation in any workplace. 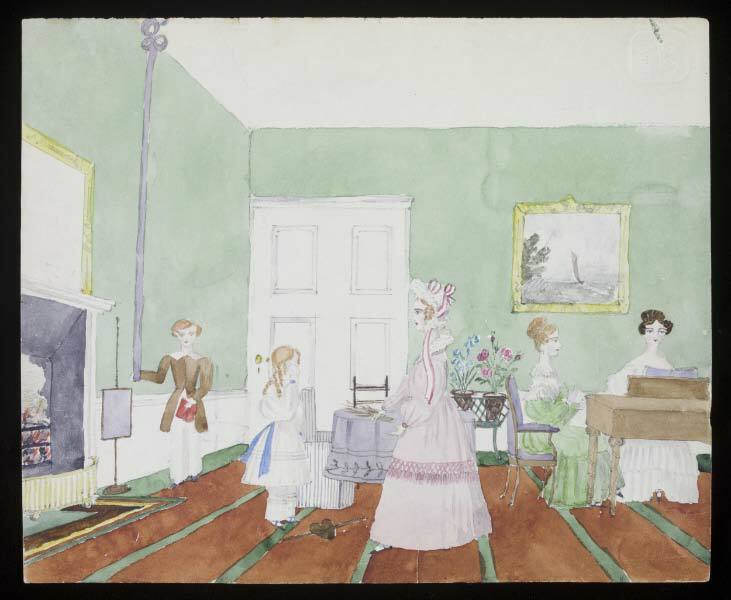 Above left: Tall Case Clock by Robert Joyce, c1796, New-York Historical Society. Above right: Tall Clock by Robert Joyce, c1797, Metropolitan Museum of Art. 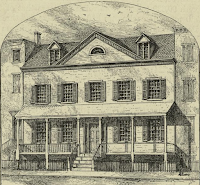 Lower right: First Bank of the United States, completed 1797; now part of Independence National Historical Park, Philadelphia. Read more about Alexander and Eliza Hamilton in my newest historical novel, I, Eliza Hamilton, now available everywhere. • Before private jets, there were the luxurious private train cars of the Pullman Company. • The White Cockade: a Jacobite tale. • The beautiful, forgotten color language of 19thc naturalists. • "For the sake of the prospect": experiencing the world from above in the late 18thc. • Feline dress improvers: the Victorian fashion in bustle-baskets for cats. • Image: Byron's betrothal ring. • An old chair in new clothing. • Little Red Riding Hood in 1810 was much more cautionary. • Elizabeth Whitman, the mysterious coquette of 1788. • How American jazz delighted the rest of the world during World War One. • The secularization of pagoda imagery in 18thc Europe and China. • First Lady Julia Grant and the actress Marie Dressler. • Image: Bessie Stringfield, aka "The Motorcycle Queen of Miami", and the first Jamaican-American woman to ride solo across the US in 1930. • A family crisis for Gen. Nathanael Greene over playing cards. • The "Bronze-Age hunk" with the perfect smile. • The country vicar: a popular character in fiction, the life of a real vicar was a bit different. • Rediscovering an American community of color in pictures. • The astonishing patchwork "graveyard quilt." • Image: Sterling advice from Washington Post editor Ben Bradlee. The cabinet was offered to Napoleon, who declined to purchase it, preferring to have new designs and decor to reflect his empire rather than such reminders of the ancien regine. 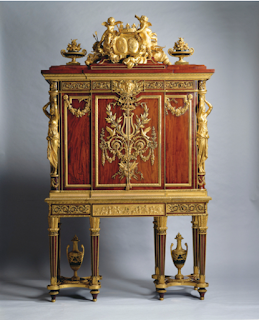 In Britain, however, George IV, however, had no such qualms, and eventually bought the cabinet for 400 guineas in 1825. It has remained in the Royal Collection ever since: a true masterpiece. If you received this post via email, you may be seeing a blank space or black box where the video should be. Click here to view the video. 1814 puts us square in the official Regency period (1811-1819) when George III was deemed too insane to rule and the Prince of Wales became Prince Regent. Social historians tend to use the term Regency for a much broader period, from about 1800 (sometimes earlier) until 1837 when Victoria became queen. 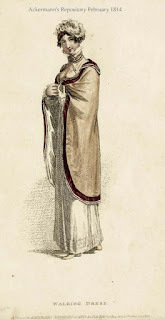 Interestingly, the style so often associated with the Regency—the simple vertical lines ornamented with designs from Greek, Egyptian, and Etruscan art—have, by about 1814, begun to get a little fussier. By the end of the official Regency, that simple, classical look will have disappeared entirely. In 1814, though, we’re just beginning to see the change. In these two prints, it’s not as obvious as it is in some others. 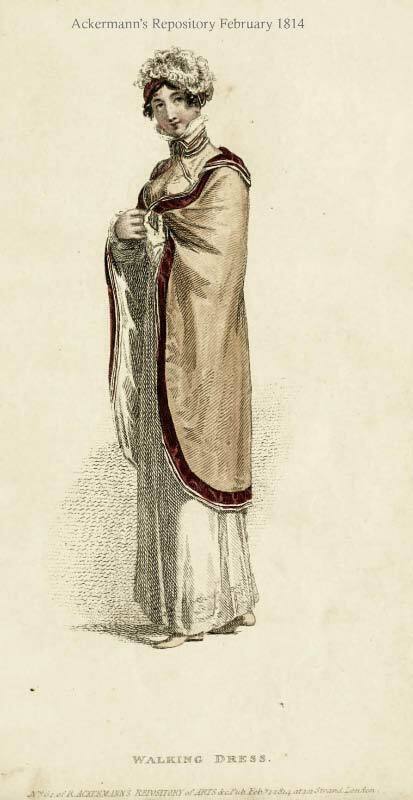 The walking dress especially still expresses the graceful simplicity of earlier years.